Personalized New Baby Boy Giraffe - 17"
It’s a boy! Create a wonderful New Baby Announcement with this adorable Giraffe personalized just for him. Our New Baby Giraffe makes a great gift idea that he can treasure as a wonderful keepsake from mom & dad. 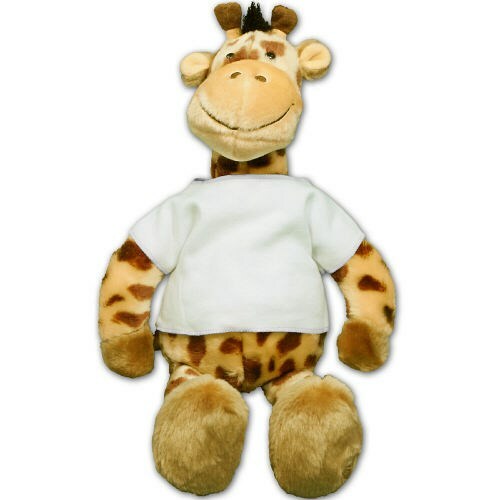 Geri the Giraffe is a stuffed plush animal that everyone adores. Geri measures about 17” from head to toe and is the perfect size for squeezing and snuggling up to when it’s time for bed. This adorable giraffe features button eyes and soft plush fur. Customize the T-Shirt the Geri wears to make the perfect gift for anyone on your shopping list. Free Gift Wrapping and a Free Gift Card are included to create a thoughtful presentation. Additional Details 800Bear has a large variety of Personalized New Baby Boy Plush Animals. When a new baby comes into your life, shower them with fun and personalized gifts they can cherish a lifetime. Our Personalized New Baby Boy First Teddy Bear & our Comfy Cozy Puppy Blanket also makes a fun welcoming gift idea for you new baby boy.